Arrive at the Magellan, a paradise situated 200m from the beach, where you may enjoy a refreshing dip in the pool, relax and get to know the surrounding nature. In the afternoon you will be introduced to the herd. No interaction is required, except sitting in peace with them. Absorbing the jungle sounds, observing the horses as they graze, clearing your mind of all thoughts and noise. As your mind quiets so does your energy, opening to the peace of being present in the moment. Now the horses are drawn to you and approach you, curiously nudging and maybe even nibbling. Let them be, with no apprehension and let them get to know you and your energies. This will make your rides and treks together more enjoyable and relaxed for both you and your equine partner. Evening cocktails and dinner at our terrace where you will be served some of our specialities of fresh organic gourmet meals. After a healthy breakfast of fresh breads, jam, organic fruit juices & eggs from our happy & free range chickens, we set out for an unforgettable ride into the jungle! This trail winds it way through the jungle, following the small river. Cayman’s are hidden in the shallow waters, storks perch on floating logs, howler monkeys swing from tree to tree. The jungle is close as the horses pick their way through the dense shrubs and lower branches. Giant ancient trees tower over us ,as we pass by the gigantic roots. The afternoon is all about learning and observing the medicinal plants of the jungle on a guided tour on foot, with a very knowledgable & passionate guide at Alma Verde. Under the shade of a giant tree , try different herbal teas and learn their benefits. Back to Magellan Inn for frothy iced Cocktails by the pool and time to chat and exchange our days adventures. Or enjoy a massage in the quiet of the gardens. Dinner will be a palette of flavours and colours. After breakfast we hit the trail that follows the 40 mile long beach of Playa Grande to the lagoons of Rio Estrella. The trail winds into the jungle where the monkeys, parrots, toucans and iguanas live and where sometimes a jaguar, ocelot or maraguay may be spotted. The river originates from the rolling Talamancan mountains, home to the Indigenous Bribrí tribe, and reaches it's end in sea north of Cahuita. This unspoilt environment is the homeland of birds and fish, as well as monkeys and sloths, iguanas and crocodiles. With a little luck we might spot the protozoans among amphibians, sun bathing along the river shores. It is an experience that equals the beauty of the Amazon Delta. Then it is back home on a long stretch of untouched beach, galopping and splashing through the waves. During the turtle nesting season, giant-big craters can be seen where the mother turtles have come up to lay and cover their eggs. If you are here during turtle season, an extra expedition at night ,can be organized to participate and watch this amazing spectacle of mother nature! Back to the Magellan Inn cold drinks, massages and/or Yoga. Start with breakfast and then it’s time to head for the amazing coral reef of the National Park of Cahuita. 15 km. of sandy, white beaches and turquoise sea. The boat takes us out to the different coral reefs where we will see a multitude of colorful tropical fish. Pink, yellow, andzebra striped fish, as well asblowfish, baracudas, Stingrays, dolphins and a wide variety of sea urchins, shell fish and more! Cahuita National Park is best known for the coral reefs, you are likely to see light yellow brain, elkhorn, and blue staghorn corals, sea fans, and gorgonians as a backdrop to the more than 500 species of fish endemic to the reefs. After for those who would like, you can hike back through the National Park of Cahuita along the white sandy trails and turquoise waters to observe the wild animals and fauna and swim in the little secluded coves. The white faced monkeys will follow us on the lookout for goodies, so be careful, they love anything shiny like sunglasses and car keys to chips and fruit! Arriving in the village of Cahuita you can enjoy a lunch in a local restaurant (free lunch day). Check out the local artisanal shops and later try a refreshing cocktail as the sun sets over Cahuita. After breakfast we head to the jungle on a 5 hour horse trek into the mountains to the waterfalls. On the way, our guide will show us the wonders of Costa Rican nature. You will see howler monkeys, sloths, iguanas, poison dart frogs, toucans, and parrots along the way. Following the beach, then we head up into the mountains with spectacular views to the ocean. Passing through Costa Rican cow country, we leave under the shade of trees to rest and we head deep into the rainforest mountains, by foot. Following the paths through the jungle’s dense vegetation we are in close contact with the vibrant nature. Howler monkeys, sloths, iguanas, poison dart frogs, toucans and parrots live here, we are just passers by, so with respect and admiration we leave no footprint behind. It's time to jump in the cool mountain waters and enjoy a picnic and a rest! The pure water of the mountains and the energy of the intense green jungle plants, invigorate the physical body as well as the mental and spiritual. Let the waters spill over you, washing away stress and worries. Frothy iced Cocktails by the pool and time to chat and exchange our days adventures. Or enjoy a massage in the quiet of the gardens. After breakfast we will take a drive to the Jaguar Rescue Center. A special place where they rehabilitate injured or orphaned animals back into the nature. These people are passionate about what they do here. This is not just a regular tourist place to see wild animals. They are only open in the morning so that the animals have their peace and full attention all afternoon. They perform surgery on animals who are gravely injured, and go as far as to putting prosthetic wings etc. From sloths, jaguars, maraguays, toucans, monkeys to snakes of all types and colours. You will learn much on your visit here. After lunch and a rest either by the pool or in a hammock. Into the ocean with the horses! Don’t worry if you fall, it's only a short fall and a little splash. This is an incredible experience that they love, as the waves wash around and refresh them. Only laughter & fun! After this full day, we return to Magellan Inn for a frothy Pina Colada or frozen Maragarita! Then a scrumptious dinner with tropical flavours. Today we will ride for an hour and a half to a very special and interesting place La Cabra Feliz (The Happy Goat), a local self sustainable eco farm, where all fruit & vegetables are organically grown. They also reforest the jungle where necessary with hard tropical woods that are becoming rare. A goat farm provides fresh goat milk and a variety of goat cheeses. The goats dropping are converted into use for fertilizers and also creating gaz to heat the water and for cooking. A fish pond for the breeding of Tilapia, free range chickens for eggs, goat for milk & cheese, fresh organic vegetables & fruit, provide everything one needs to survive and live totally natural and chemical free! Don Roberto and his lovely wife & daughters will treat us to a %100 organic lunch of fresh salads, vegetables, grilled fish and fruit. He makes a most delicious smoothie of guayabana, passion fruit and a little secret! Oh , so smooth and invigorating! Then he will take us on a tour of his farm, showing how everything is grown and recycled for use. It is the perfect example how one can live off the earth, self sustainably and give back to the earth, a little holistic family farm. 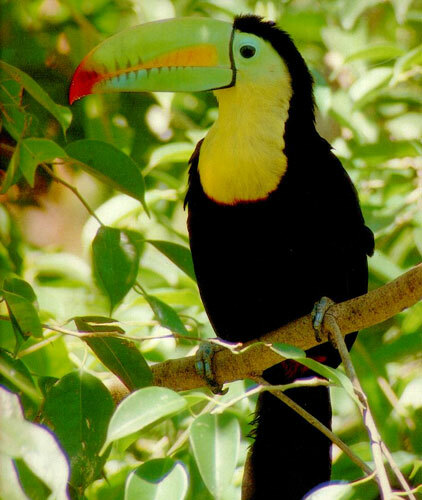 The trail also leads into the jungle where Don Juan will show you the wonders of the jungle, toucans, parrots, monkeys, and whatever animals crosses our path during this timeless walk.